Bed and Breakfasts near Seadoo South West for 1 night from Sat Apr 20, 2019 to Sun Apr 21, 2019 within 25 miles, in an Average Nightly price range of £1 to £200. The Haytor Hotel is an elegant detached Victorian Villa. It is located in a conservation area on Meadfoot Road just 200 metres from Torquays' harbour with all the best restaurants Torquay has to offer. Affordable luxury at its best. 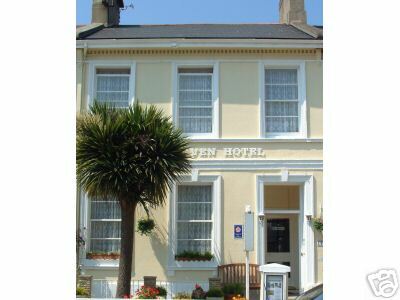 Ravenswood is a friendly B&B hotel, conveniently located in central Torquay, within easy walking distance (400m) of shops, restaurants, beaches, clubs and pubs. We offer simple, clean, comfortable rooms and a traditional English breakfast. Braddon Hall is the perfect choice for a holiday on the English Riviera, being located only 500 metres from the harbour, shops and beaches. We aim to give a quality service, combined with excellent value for money and look forward to welcoming you. 4* Guest House just a 5 minute walk from town and sea front with outdoor heated pool, large bar, large car park and children's playroom. A variety of rooms all with en suite, including twin, triple and family rooms, some with sea views. The Riviera Hotel is ideally situated in Belgrave Road in the heart of Torquay on the beautiful English Riviera. A short distance from the town centre stunning parks and the sparkling blue waters of Torquays sandy beaches. With 143 bedrooms the Riviera is one of the few hotels in Torquay able to accommodate families. Half of the en-suite bedrooms are family rooms for families of 3 4 or 5 people. The hotel has 1 function/meeting room and offers entertainment most nights free of charge to hotel guests. There is a car park on site (chargeable) a Sports Bar with Sky Sports & BT Sports plus an outside seating area where you can relax and enjoy the famous sunshine on the English Riviera and an indoor swimming pool Jacuzzi & gymnasium. Torquay is a hugely popular destination for families throughout the year from Bargain Winter Breaks to Spring and Summer Holidays and Autumn and Turkey n Tinsel Breaks. There is so much to see and do in Torquay and the surrounding areas Model Village Caverns Abbeys Paignton Zoo Plymouth Marine Aquarium stunning coastal walks... even the Eden Project - all are an easy drive from the Riviera Hotel. The beautiful Marquis Hotel was built in the 18th century as a holiday home for the 3rd Marquis of Bute. Around 1920 it was converted into a fine hotel and retains many of the original features and has fine sea views. The hotel has undergone a major renovation including brand new bathrooms in all the bedrooms. We have 44 en-suite bedrooms, all with flat screen TV's, free Wi-Fi and tea making facilities. We welcome Business and Holiday guests alike. The Marquis Hotel adjoins Tor Abbey Park, with a private entrance to the Riviera Conference Centre with its tennis courts, bowling greens and 9 hole pitch and putt. This hotel is within a 15-minute walk of Torquay's Princess Theatre, the town centre, Torquay Harbour, and popular beaches. Spotless,central and friendly. We are situated in a quiet conservation area a short stroll from beach, harbour, shops, Torre Abbey and Riviera Centre. All rooms are ensuite and with all the usual amenities. Non Smoking and no pets. Own Carpark. Family run Licenced Hotel close to the Beach, Town Centre, Conference Centre, Theatre. All rooms ensuite. Extensive Breakfast Menu. Evening meals on request. Open all Year. We aim to make your stay as comfortable as poss. Contractors welcome. We go to a great deal of effort to ensure your accommodation and breakfasts are of the highest standard. We use only the finest ingredients and our local butcher makes the sausages especially for us and we also use extremely tasty thick cut bacon. br / br / br / br / Our rooms are large spacious and well equipped with free high speed wi-fi. Many of our guests make particular reference to the beds and comment frequently on how well they slept. br / br / br / br / All our bedrooms are furnished to a high standard and they all have tea and coffee making facilities (and biscuits) flat screen freeview television and free WiFi throughout hair dryers and personal security box. Most also have irons and ironing boards. A small family run non-smoking pet friendly licensed hotel ( with swimming pool ) set next to parkland, 500 mtrs back from the seafront. Less than a five minute walk to both Torquay train station and The Riviera Conference Centre. The Elmdene is a short distance from Torquay's beaches, railway station, the conference centre, town centre, theatre and harbour. We offer quality accommodation, excellent home cooked food and high standards of comfort and cleanliness throughout.